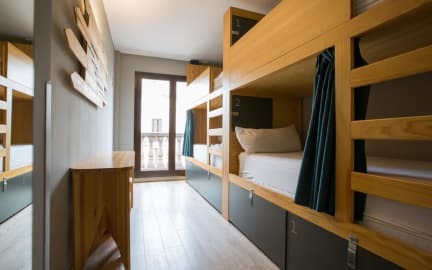 Yeah Hostel Barcelona, Barcelona, Hiszpania : Rezerwuj teraz! With us you’ll relax, have fun and party in the bar area, and when you go to your room you’ll get a good night sleep in our comfortable custom-made bunk-bed and silent rooms. You’ll wake up fresh and strong ready to visit the most famous touristic attractions. We’re between Paseo de Gracia where you’ll find Casa Milà “La Pedrera” and Casa Batlló (5 minutes walking from the hostel) and Sagrada Familia, Gaudi’s emblematic temple. Even if you’re traveling solo we have the perfect solution for you: walking-tour and night tour. From here you’ll be able to walk to some of the most important sightseeing sites and save money in transportation. Just book and come to the best hostel you will visit! Important! Please note that if you booked with a debit card, please warn us if you will be arriving more than two hours after your stated time of arrival. Otherwise your booking will be cancelled and the beds released. If you have a group booking, we will always try our best to put you together in the same room, but keep in mind this is a hostel and that's not always possible! There is a mandatory 5 Euro refundable deposit for the keys. Towels are also available for 2 Euro . Great hostel, one of the best ones I've been to in Europe. Despite the fact that my trip was a bit out of season (early December) the atmosphere was good. They host dinner for 10 euros which is a good way to meet new people - handy if you're travelling solo. The hostel was clean, all facilities were new and in good condition. The location is also good, not far from Metro station, walking distance to Sagrada Familia and in general it's in a nice neighborhood worth exploring.